The sun and moon have disappeared from the sky. The worlds on the branches of the cosmic tree Yggdrssil have grown dark and cold. The gods and giants are on the brink of war. Mankind has descended into anarchy. Welcome to the Age of the Sword... Welcome to Ragnarok! 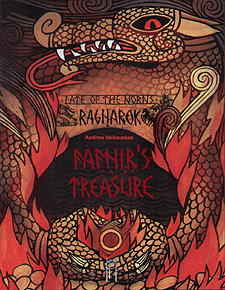 Fafnir's Treasure is a standalone Fate of the Norns: Ragnarok saga that will bring 2 to 6 players deep into the dark age of Ragnarok. They will be engaged by the emissaries of the gods, and must avoid perils both known and unknown to find the most wondrous treasure of all - the legendary hoard of Fafnir the dragon! Fafnir's Treasure uses the "light" game rules of the Runic Game System (RGS) and a set of pre-generated dwellers so you can experience the full fury of Fate of the Norms: Ragnarok with nothing more than your imagination.